TULARE, Calif. - March 12, 2016 - David Gravel claimed his first World of Outlaws Craftsman® Sprint Car Series victory of the season Saturday night at Thunderbowl Raceway as he held off Shane Stewart through the 35-lap feature. 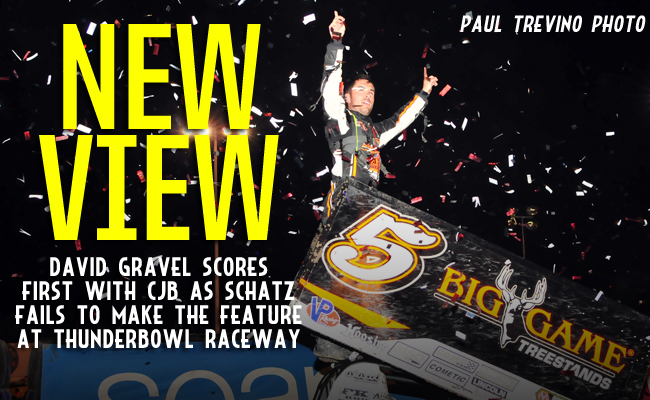 The win was the first series win for Gravel since he won the National Open at Williams Grove Speedway in 2014 and the first for him with his new team, CJB Motorsports. "It's awesome to win this early in the season," Gravel said. "Running second last week and now a win is great. The track was narrow but I had to take advantage of our track position. I didn't want to give up a win there - you never want to give up wins. I tried to be aggressive when I was supposed to be aggressive and be passive when I was supposed to be passive but it worked out." Saturday's action at Thunderbowl came one day after rain forced the cancellation of the first night of racing at the track in Tulare, Calif.
Brad Sweet, the current championship point leader, kicked off the night by scoring the quick time and setting a new track record of 12.327 seconds in his No. 49 Razorback Professional Tools car. Sweet set the previous track record of 12.582 seconds at Thunderbowl last season with the Outlaws. Roseville, Calif.'s Willie Croft took the pole after winning the dash with Gravel starting on his outside. Notable before the start of the feature was the absence of reigning series champion Donny Schatz in the main event. After missing the transfer in his heat race, Schatz started in seventh in the Last Chance Showdown and was unable to advance beyond sixth place. With the new provisional rule in place that does not let drivers improve their points position if they run in the feature, Schatz opted not to take the provisional and start the feature. It was the first time since Nov. 2, 2012 that Schatz has not started a World of Outlaws feature. When the green flag fell on the night's main event, Gravel quickly jumped to the lead in his No. 5 Big Game Treestands car on the start as Croft stumbled. Stewart also battled by. Gravel quickly caught the back of the field and had to contend with a hard-charging Stewart, who looked up and down the track for a line around the No. 5. Through several cautions and restarts, including a red flag stoppage on lap 15 that involved four cars and ended the night for Joey Saldana, Stewart tried to get the position from Gravel, but Gravel held the lead. "I'm sure Shane was right on me there late with me behind Kerry (Madsen)," Gravel said. "I was just protected. I knew he wouldn't be able to pass me with the line I was running and just tried to do the right things." When the checkered flag fell, it was all David Gravel - a flag-to-flag win for the Watertown, Conn.-native. "I love this place though," Gravel said. "Ever since the first time I came here it's always been awesome and I've always been fast. I'm glad I got a win here." Stewart, who currently sits second in the series championship standings, was visibly disappointed to not get the win for his No. 2 Larson Marks Racing/Eneos team but said he was happy for another podium finish. "We were able to take advantage of our starting spot," Stewart said. "It was just really tough to pass. I actually got a little tight after that red and I'm not really sure why. David did a good job. I had a few shots at him but he just didn't screw up enough for me to get by him. So good job to him - these wins are really hard to come by." Croft, driving the No. 26 car for Rudeen Racing, said he was pleased to kick off his 2016 run with the team as well as he did. "We had a great night all night," Croft said. "I was a little bit tighter than I expected for the main event. We kind of loosened up on the red which got me to rotate a little better to hold on for third. I can't complain at all running third with these guys. It's a huge accomplishment for myself." "To start off third place with the Outlaws, I'll take it. I'm just super stoked." Jason Johnson was the night's KSE Racing Hard Charger, advancing 11 positions to finish in 12th. Sweet, who finished the night in the fourth position, extended his points lead to 68 over now second place Stewart. The World of Outlaws Craftsman Sprint Car Series returns to action next weekend at the Stockton (Calif.) Dirt Track. The series kicks off the FVP Western Spring Shootout on Friday night, March 18 and wraps it up on Saturday, March 19. Great seats remain and are available by calling 844-DIRT-TIX or by visiting WorldofOutlaws.com/Tickets. RACE NOTES: Brad Sweet picked up the quick time of the night and the new track record after a lap of 12.327. He broke his previous track record, set last year, of 12.582… Tonight was first time since November 2012 (World Finals) that Donny Schatz did not start a World of Outlaws feature. The last time he did not qualify or race into a feature was at Lincoln Speedway last season… David Gravel scored his first win since the National Open in October 2014. CONTINGENCY WINNERS - MSD Ignitions ($25 cash): Terry McCarl; MSD Ignitions ($50 cash): David Gravel; Penske Shocks ($50 cash): Logan Schuchart; Mobil 1 ($50 cash): Logan Schuchart; JE Pistons ($50 cash): Daryn Pittman; VP Racing Fuels ($50 cash): Daryn Pittman; Edelbrock ($50 cash): Paul McMahan; Comp Cams ($50 cash): Paul McMahan; Morton Buildings ($50 cash): Paul McMahan; Cometic Gasket ($50 cash): Jason Johnson; Super Flow ($50 cash): Logan Schuchart;Craftsman/Sears ($100 cash): Willie Croft; KSE Racing Products ($100 product certificate): Jason Johnson;Comp Cams ($50 product certificate): David Gravel; Mobil 1 (20% off Mobil1RacingStore.com): Jason Sides; JE Pistons (Set of Rings): Logan Schuchart; JE Pistons (Set of Rings): Jason Sides. SEASON WINNERS: Brad Sweet - 3 (Volusia Speedway Park on Feb. 13, Volusia Speedway Park on Feb. 14, Cotton Bowl Speedway on Feb. 26); Donny Schatz - 2 (Volusia Speedway Park on Feb. 14, The Dirt Track at Las Vegas on March 4); David Gravel - 1 (Thunderbowl Raceway on March 12); Daryn Pittman - 1 (Royal Purple Raceway on Feb. 27); Joey Saldana - 1 (The Dirt Track at Las Vegas on March 3); Shane Stewart - 1 (Arizona Speedway on March 6).